Halo: Fireteam Raven is a new arcade game set to be released originally in the US and Canada. It enables four players to battle each other out on a 130-inch, 4K screen. 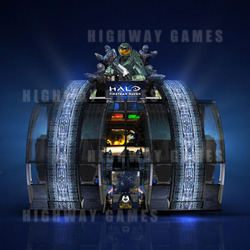 The arcade game has four multipurpose machine guns and will be set in the same time frame as the 2001 game, Halo: Combat Evolved. The game will be coin operated and will allow players to scan a QRC code to link their online Halo accounts and verse other friends.